Home News OH, My God, it is "rubber bug"
Black spotsobserved by individual experimenters in a serum containing culture system wereconsidered as blackworms. In fact, this dark matter may be the crystallizationof protein/salt molecules in serum or culture media. The movement of thissubstance in the culture system is Brownian motion, which is caused by theaction of the liquid. It is not the autonomous movement of living things. Andno laboratory has ever separated biogenic genetic material from the blacksubstance. As the incubation time increases at 37 ° C, the formation ofprecipitate increases. Proper thawing and inactivation (without heatinactivation, if not necessary) can reduce black spots. At the same time, thisphenomenon usually occurs between the same batch of serum. Serum of a lot ofgood, pro, quickly stocking it! When thawingfetal bovine serum, follow the suggested gradual thawing method (-20 ° C to 4 °C to room temperature). Experiments have shown that it is effortless to produceprecipitate if the temperature of thawed fetal bovine serum (e.g., 20 ° C to 37° C). Thaw fetal bovine serum, please feel free to shake evenly, so that thetemperature and composition uniformity, reduce the occurrence of precipitation.Do not leave fetal bovine serum at 37 ° C for too long. If placed at 37 ℃ for too long, the fetal bovine serum will become cloudy, and manyof the more unstable components of fetal bovine serum will, therefore, becompromised, and affect the quality of fetal bovine serum. Experiments haveshown that heat-inactivated fetal bovine serum that has been appropriatelyprocessed is not required for most cells. 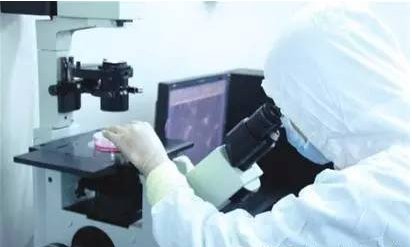 Fetal bovine serum treated with thishad little or no effect on the growth of the cells and even led to a decreasein the rate of cell growth, usually because the high-temperature treatmentaffected the quality of the fetal bovine serum. The heat-treated fetal calfserum, the formation of sediment will be significantly increased, the depositobserved under an inverted microscope, such as "black spots,"researchers often mistakenly believe that fetal bovine serum was contaminated,while the Fetal bovine serum placed in 37 ℃ environments, will make this precipitate more, make the researchersmistaken for the microbial expansion. Why do you needheat inactivation?